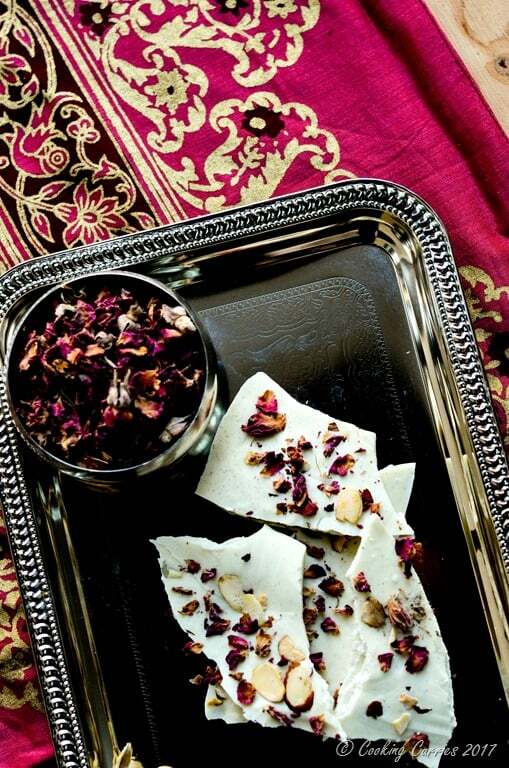 Fragrant dried Roses come together with White Chocolate and Cardamom along with some toasted Almonds for a nutty bite in these very exotic and delicious dessert bites! 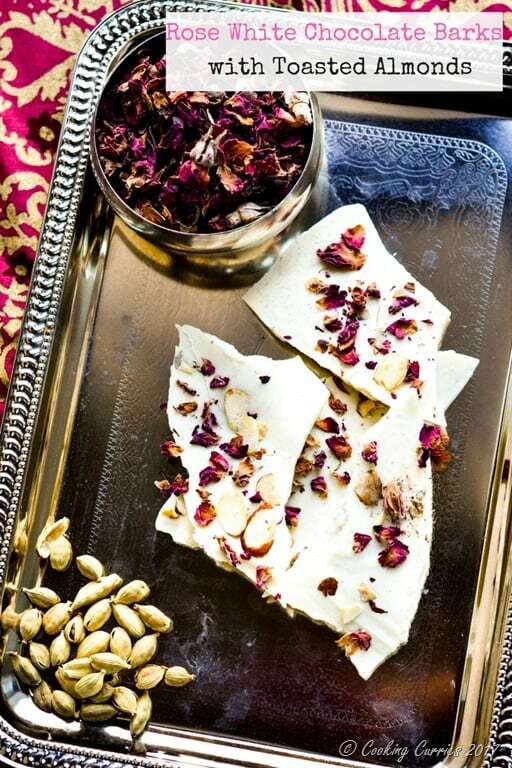 This may not be your typical Valentine’s day dessert but there is something exotic and mesmerizing and romantic about the dried roses and of course, chocolate! I actually made this during Diwali time as an easy sweet along with the rest of Diwali sweets platter that I took along for a Diwali party and to say, this was a hit would be an understatement. Several people who knew I love a good dessert, came and told me to go try these amazing rose chocolate sweet. Only to later know that I got them along It felt good! So, this is one of those fusion recipes that works well for Valentine’s day, Diwali, Holi, Holidays or even just like that. It is so so easy to make and takes only about 10 mins of work and some time for it to solidify and come together. You can even pour out the chocolate and everything else on it on a sheet before you start getting ready for a party and by the time you are ready, your dessert is ready and whether you are taking it out somewhere or serving it at home, everyone will love it and love you for it! The dried rose petals and buds that I used was something that I brought in by accident from one of our trips to Dubai. We went to the Spice Souk in Old Dubai with some friends and my friend bought some for herself. Even though I wanted to buy, I wasnt sure I will be able to clear customs with it. But it ended up in our bags by accident and I only realized after we got to our hotel room and then it was too late to give it back to her. It did clear customs though and I am happy for that accident 🙂 I have seen those on Amazon and you can buy them from there. The rose extract that I use is Neilsen Massey’s Rose Water. I have raved about their chocolate, coffee and other extracts many a times before in different posts. This one is also anything but exceptional. Melt the white chocolate chips in the microwave in 15 sec intervals and giving it a mix every 15 secs, till it is all melted. Mix the rose extract and ground cardamom to it. Line a baking sheet with parchment paper and pour this white chocolate over it and spread it out. 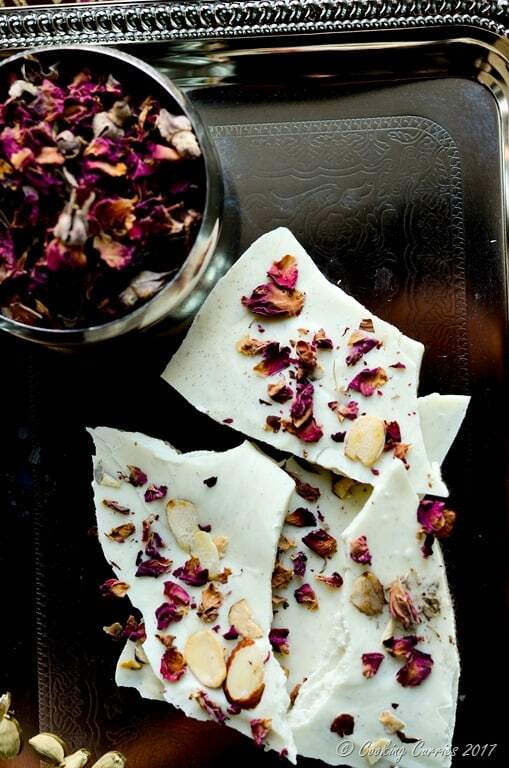 Immediately sprinkle the dried roses and toasted almond slices over it. Let it cool outside at room temperature (or you can chill it in the refrigerator) fro about 30 mins or so till the chocolate has hardened. Break into bark and you are ready to go! Thank you Hauke! Rose has a very strong perfume to it, so you have to be very careful in using just a little of it. And for some, it takes a little getting used to. I love it, though! So fun! I plan on making some homemade chocolate bark this weekend actually! These are so pretty. 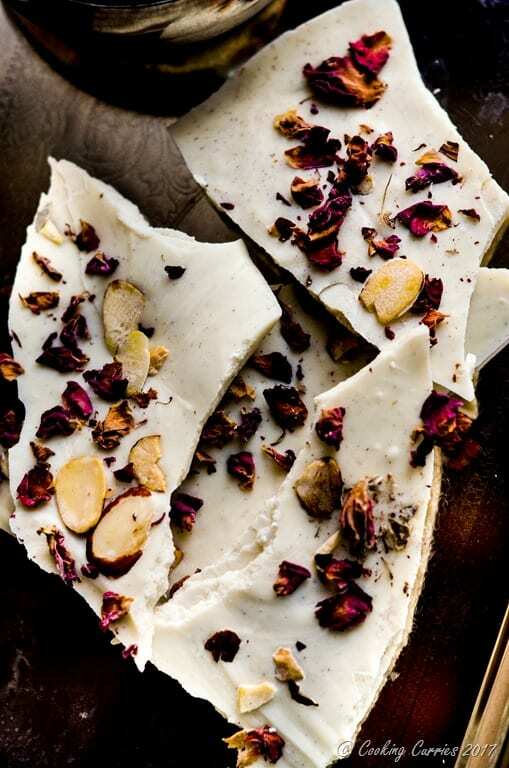 How lovely to have the rose and almond together, I bet it’s delicious. Oh my goodness, this looks beautifully delicious! Wow sounds very good. I like rose flavor, I usually add to Gulab Jamun. 🙂 very interesting post Manju! Oh wow, these look heavenly! I love white chocolate and just posted a white hot chocolate today, haha! I love the addition of rose, it makes it so beautiful and a lovely flavor I bet! These are very gorgeous!